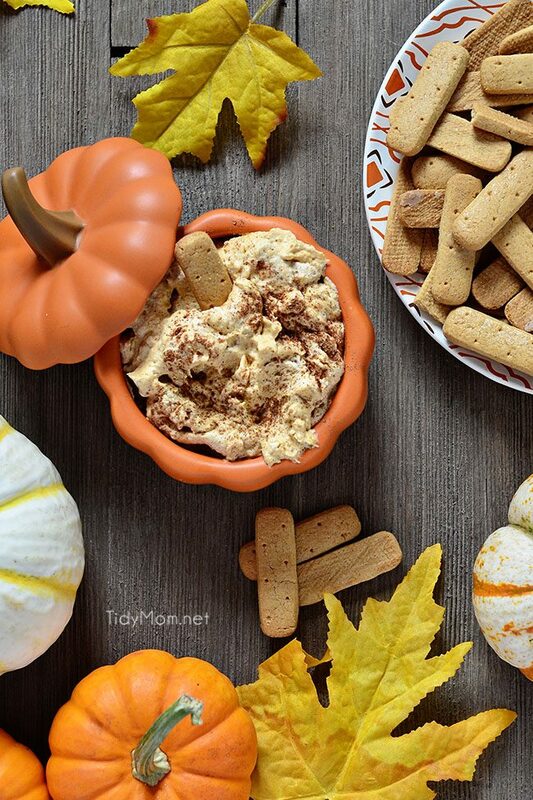 Pumpkin Fluff is a creamy, fluffy pumpkin dip that is the perfect fall treat served with graham crackers, vanilla wafers, apple slices or just with a spoon. It’s a family favorite we make every fall. We make a lighter by using fat-free/ sugar-free ingredients, but of course, if you want to live on the wild side, use the full-fat versions. I found this recipe for pumpkin fluff a few years ago when I was doing Weight Watchers. It was a big hit in my house with everyone, it quickly became a requested snack, and no longer “diet food”. I first posted this recipe in 2009, pumpkin fluff is still a family favorite fall threat that we make every year! I want to share the recipe with you! You can tweak it to your liking. It’s pretty low cal (and high fiber) the way I make it – but if you’re really trying to keep it low, just change the milk to skim and use the Fat-Free Cool Whip. 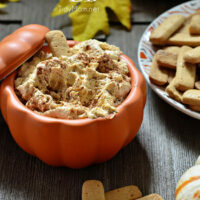 If you want to serve pumpkin fluff as a dip, vanilla wafers, animal crackers, ginger snaps, graham crackers or even apple slices work wonderfully to scoop up a taste of this fluffy pumpkin dip. You can also serve pumpkin fluff in sundae glasses or dessert shot glasses topped with graham cracker crumbs and a spoon for individual dessert cups. CHECK OUT HOW EASY THIS PUMPKIN FLUFF RECIPE IS TO MAKE! WATCH THE VIDEO! LIKE THIS PUMPKIN FLUFF? IT? PIN IT! What Else Can You Make With Pumpkin Fluff? Pumpkin Fluff also makes an incredible dessert! PUMPKIN ICEBOX CAKE! It’s is a delicious no-bake dessert that comes together in no time. Making it the perfect make-ahead dessert. Homemade pumpkin cannoli is another one of our favorite ways to serve pumpkin fluff. You can either buy ready-made cannoli shells or make your own using refrigerated pie crust. Fill the shells with the pumpkin dip and garnish with a few mini chocolate chips on the ends. I just love the contrast between the crispy shell and the fluffy pumpkin filling. 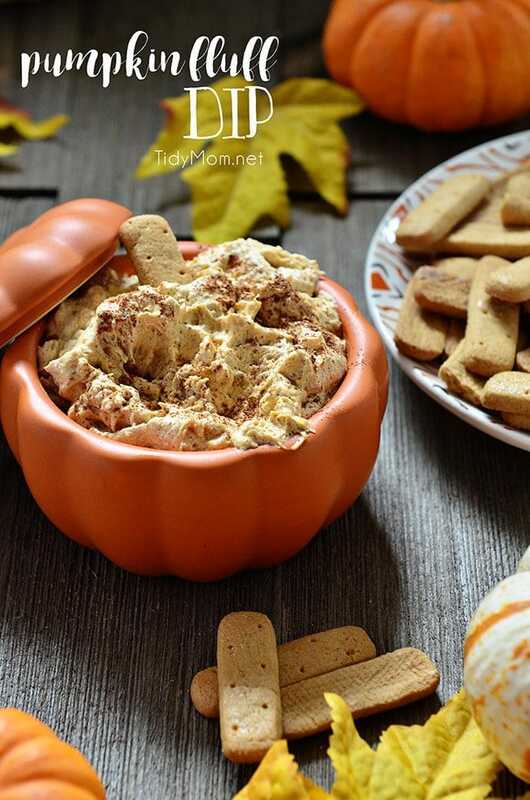 Serve it as an appetizer, snack or dessert, this Pumpkin Fluff Dip recipe will quickly take center stage. This is a great creamy pumpkin dessert for both everyday dinners and special occasions. 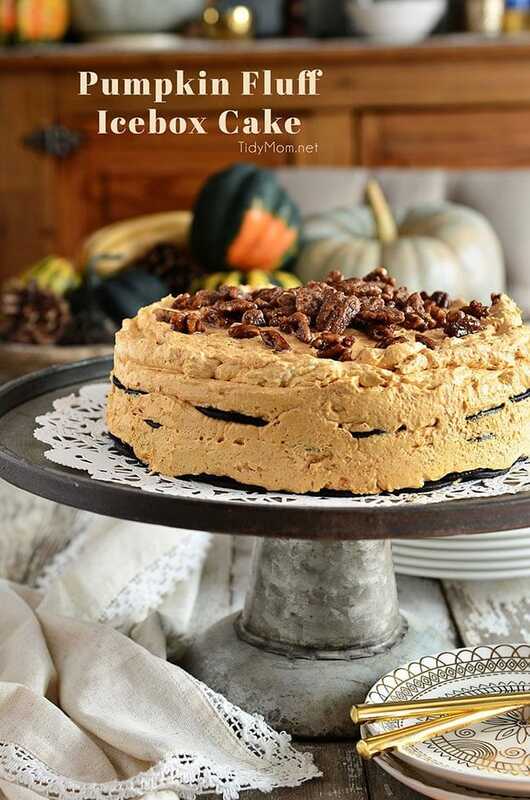 Try this pumpkin fluff dessert for your Thanksgiving table! Pumpkin Fluff is a creamy, fluffy favorite fall treat. Serve with graham crackers or stuff into a cannoli shell or just dig in with a spoon. It’s full of fiber, and if you use sugar-free/ fat-free pudding mix, Cool Whip Lite and 1% milk it’s a low cal treat you don’t have to feel guilty eating! Mix milk and pudding, add pumpkin and spice. Blend until smooth. Serve with graham crackers, vanilla wafers, ginger snaps or apple slices. Feel free to use full flat versions of any/all ingredients. Looks wonderful! I will try this soon. I love your little sundae glass and I love pumpkin! Pumpkin cheesecake from The Cheesecake Factory is my favorite, but you can only get it October – January. I can make this for all the months in between!!! What a great recipe. I love pumpkin anything, so i will have to try this. Thanks for sharing. Yum!!! I am really glad for this one!! Thanks for the recipe and linking to TMTT. This sounds really good, I love pumpkin and usually on get it at Thanksgiving. I love the idea of putting them on the graham crackers! Sounds yummy! I made this last Thanksgiving and it was great. Thanks for this – I am a Weight Watcher so I'll enjoy it! I am wondering if you can send me a link to this song in your pumpkin recipe ad ? is that possible ? Sounds delicious. What is the brand of cookies are shown with the recipe? you can certainly try it! let us know how it turns out!